Can I call you Jane? I hope so because I feel like I have known you my entire life. Do you realize how important you are? Would it terrify you to know that you have set the standard for every relationship in my life and created the ideal man for me (and every other female out there)? Pride and Prejudice- we go way back. Pride and Prejudice was the first book I bought for myself- more specifically THIS hot pink hardback version of Pride and Prejudice. It has held secret notes, important papers, and has been read so many times it no longer lays flat or even. 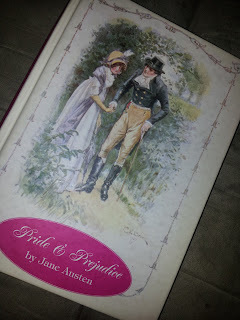 Pride and Prejudice was my entry into "classics" and made me fall in love with so many other books that I never would have bothered trying (including that OTHER Jane the Bronte sisters imagined up). Lizzie Bennett is the ultimate heroine. She is smart but not prideful, humble but willing to stand up for what and who she believes in, and is loyal to the end. As I read Pride and Prejudice I wish ardently that I was a Lizzie Bennett, but sometimes think I am much more like a Kitty or Mary- not someone who is living a exciting life. I have faith in Lizzie. I know that even if Pride and Prejudice had ended differently, Lizzie still would have ended up fine. If Mr. Darcy would have proposed again (spoiler alert! ), Lizzie would have grieved and then moved on to live the great adventure that is her life. Lizzie is the ultimate best friend, sister, and confidant. She is what the heroines of today are lacking. 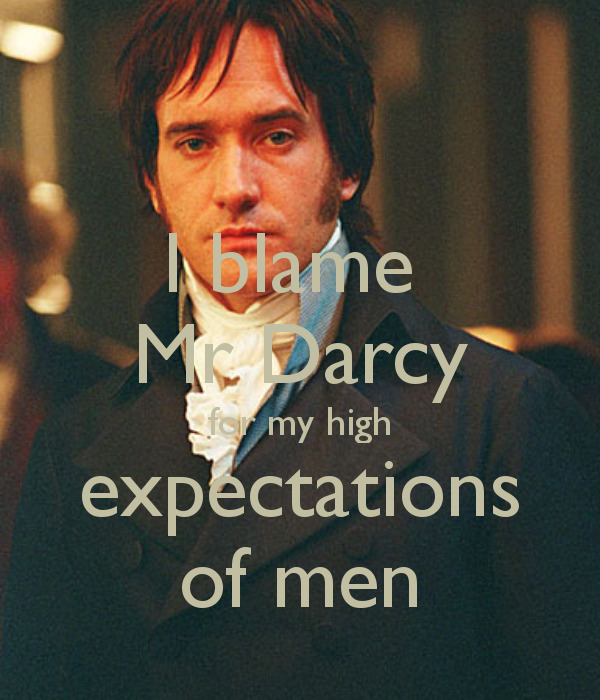 Mr. Darcy is in someways the original "bad boy". He was terrible to Lizzie and yet she and we the readers fall hopelessly in love with him. The climactic scene where Mr. Darcy professes his love for Lizzie is something that women thank you for every day. It is also a scene that has set and incredibly high and unfair example for men everywhere. Jane, thank you for Pride and Prejudice, thank you for the books and movies it inspired, and thank you for creating a heroine who was allowed to be witty and smart AND get the guy. Want to hear more from Pride and Prejudice fans and what they have to say to Jane? 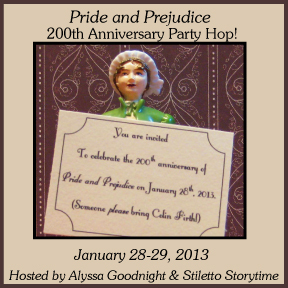 Head over to the main page for the Pride and Prejudice Anniversary Hop! Lovely post! P&P is my favorite book and was hugely influential in getting me interested in the classics (even if none of them can compare to Jane). I also agree that Elizabeth is the ultimate heroine although I've always been more of a Mr. Knightley fan rather than Mr. Darcy (I blame Clueless). Love that last Mr. Darcy pic. :) I think Lizzie is the ultimate heroine. But I have a weakness for Col. Brandon myself (I blame Alan Rickman!). I believe I have a weakness for Alan Rickman, ha ha ha! 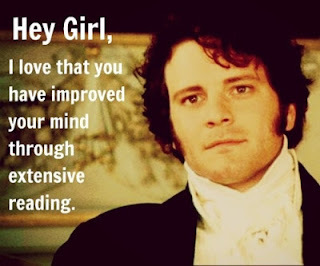 I LOVE the "Hey, girl..." Darcy picture! Your whole post is exactly how I feel about Pride and Prejudice--thanks for sharing. It still amazes me that even 200 years later Ms Austens novels still have meaning in our modern world..
Have you watched the Lizzie Bennet Diaries on Youtube? I am HOOKED! Have you ever seen the Lizzie Bennet Diaries on Youtube? It was made by Hank Green, part of the Vlogbrothers. It is awesome! It is so funny. They do a modern take of P&P using vlogs as method of narrating it. Lizzie is making vlogs and they tell the story of P&P and it is absolutely amazing! Dearest...Loveliest Elizabeth! I thank you for all of us for including that clip. What a lovely surprise to watch it today. Your letter was lovely and echoed many of the sentiments so many of us would express. Thank you so much for being part of this event and helping us celebrate 200 years of P & P. And I love that this book was a "gateway" book to the classics for you! Thanks for organizing it! I had fun! Gorgeous assembly of pics! And I love all that your copy of P&P has been through.